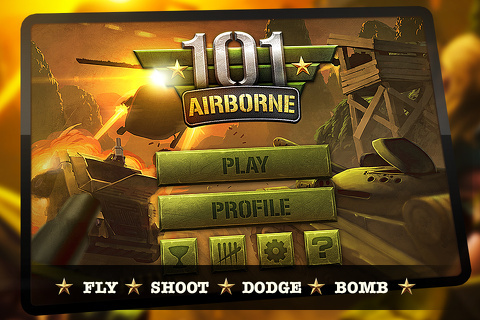 The 101 Airborne arcade game for iPhone and iPod Touch incorporates excellent graphics and multiple gesture controls to create exciting, non-stop action. The 101 Airborne arcade game does require a bit of time to finesse the gesture controls, as they sometimes overlap and can create confusion. The 101 Airborne iPhone game starts with a simple enlistment by asking you to sign in with your last name. From the home screen, you can connect with your Game Center account, but it is not a requirement. You can also access the 101 Airborne store to make in-app purchases to add tools and functions. Currently, the prices are $.99, $1.99, and $4.99 to add ammunition types and capabilities. But, most likely, you’ll simply press play to get started. The 101 Airborne iPhone gameplay begins with an overview of the gesture controls. To move your helicopter, you tilt the iPhone left and right. To fire and aim the ammunition, you press in multiple places on the screen. For certain ammunition you tap once in the appropriate location. For others, both thumbs are required. As you play the game and fly your helicopter, you may need to use one tap and multiple finger gestures at the same time and in virtually the same position on the screen. This creates confusion, as you cannot always accomplish what you want. The game play lends itself to some physics controlled gestures–particularly in the early levels–and, perhaps, some swipes and flicks would be more effective than just tapping or holding your fingers in specific locations. The graphics are truly the standout of the 101 Airborne game. The military-inspired graphics are precise and well-executed. The gamescape set in Vietnam is phenomenal. There are mountains, seas, streams, lush tropical landscapes, tents, and accurate depictions of the Vietnam fighters. The soundtrack was complementary and appropriate, so it rounded out the experience. 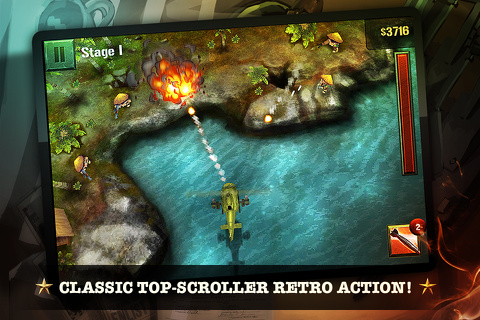 The 101 Airborne iPhone game is challenging and engaging, and it is reasonably priced at $0.99. The muddy gesture controls can certainly be mastered, but it may be just frustrating enough to keep you from becoming quickly addicted. AppSafari review of 101 Airborne was written by Jenni Ward on September 28th, 2012 and categorized under Action, App Store, Arcade, Games. Page viewed 4258 times, 2 so far today. Need help on using these apps? Please read the Help Page.